Dr. Adam F. Weaver at Mountain Top Periodontics and Dental Implants now offers All-On-4, an alternative to traditional dentures that is fixed into place using only four dental implants. Patients who have missing teeth and poor jaw bone density may benefit from All-On-4. Dr. Adam Weaver Brings All-on-4 Dental Implants to Greenwood Village, CO.
Dr. Adam F. Weaver provides the Greenwood Village area with some of the most advanced periodontal options available such as All-On-4 dentures supported by dental implants. Traditional dentures come with headaches for patients like clicking noises and slipping and sliding while the individual is talking or eating. Now, individuals with missing teeth can opt for a denture that is fixed into place using dental implants. Because the All-On-4 denture will not fall out of place, many of these potential discomforts of traditional dentures can be avoided. People who are missing all of their teeth in the upper jaw, lower jaw, or both, may want to consider a less problematic tooth replacement solution than traditional dentures. However, getting a whole mouth full of dental implants can be very expensive. Also, many individuals do not have healthy enough bone density in the jaw to support a full set of implants and they would require arduous bone graft procedures in order for their jaw to regain the ability to support them. Even bone grafting is not an option for some patients if they cannot receive bone transplants due to other health issues such as diabetes. All-On-4 may be an ideal solution in cases like these. To install the All-On-4 denture, Dr. Weaver places four permanent dental implants into the mouth in the areas where the bone density in the jaw is at its healthiest. Because the All-On-4 procedure requires only four implants, it requires less invasive surgery than installing a whole set of implants. During this visit, he then gives the patient a temporary denture to wear while he or she heals from the implant surgery. After the titanium implants fully fuse with the jaw bone, the individual is given a permanent denture that is fixed into place using abutment pieces attached to the base of the implants. The individual can then enjoy foods that would need to be avoided with traditional dentures. Embarrassing situations involving the sliding around of dentures can also be avoided. Individuals with many missing teeth may want to consider All-On-4. Interested parties can visit http://www.mtperio.com for more information. Dr. Adam Weaver is a periodontist offering personalized dental care for patients in Greenwood Village, CO since 2000. Dr. Weaver attended Brigham Young University, and during that time took a two year leave to serve as a missionary for the Church of Jesus Christ of Latter-day Saints. Upon his return he completed his bachelor’s degree in Medical Science. He attended dental school at the University of Colorado Health Sciences Center where he received his Doctor of Dental Surgery degree. He joined the periodontal residency program at the V.A. Medical Center in Milwaukee, WI, and earned his Masters of Science degree at Marquette University. Dr. Weaver is fluent in Spanish, Portuguese and Guarani. He is part of one percent of dental professionals providing the only FDA cleared laser procedure for gum disease and periodontal treatment. 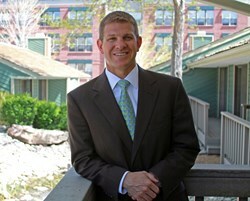 To learn more about Dr. Weaver and his dental services visit his website at http://www.mtperio.com and call (303) 800-0120.